Big shoulder muscles are one of the most impressive parts of a strong man’s body. It’s hard to think of an impressive male body without well-built delts. Yesterday, I was at the gym for an upper body workout. Normally, I train in the afternoon but yesterday I had to train in the morning for personal reasons. While I was warming up my shoulders, a man at the gym came to talk to me. He said he has been training in this gym for 4 years and I have the biggest shoulders he has ever seen in this gym. When I told him I started lifting weights only 8 months ago, his eyes popped out. 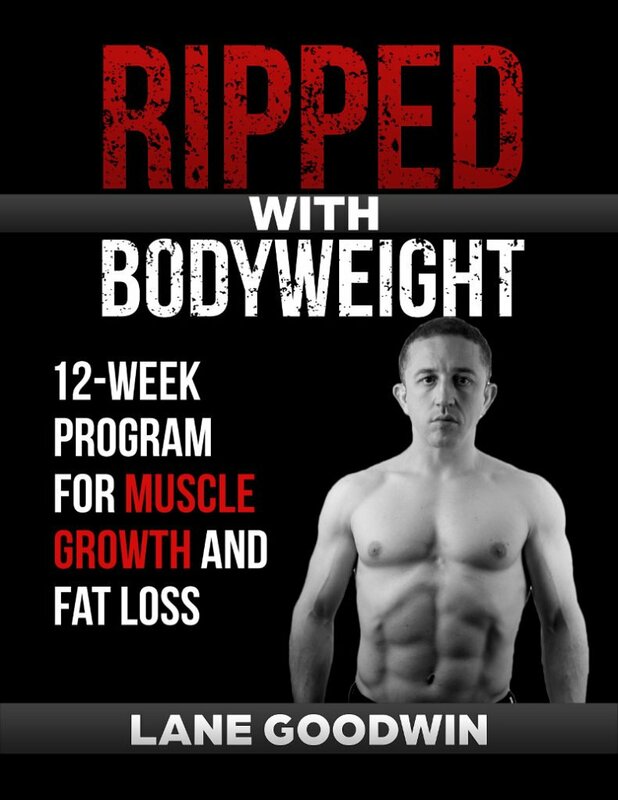 I explained to him that I had already built an excellent foundation by bodyweight training before I touched weights. If you consider that I was fat, weak and out of shape a few years ago, you can understand how proud I felt. The reason I could build such impressive shoulders is that I only go for the best workouts and skip the rest. In this article, I will show you the best shoulder workouts I do for building killer deltoid muscles. I always go for full body workouts to build my muscles. Full body workouts employ more muscles so you can lift heavier weights. Lifting heavier weights means bigger muscles. Standing barbell military press is the best exercise for building impressive deltoid muscles. You use your front deltoid muscles to push the barbell above your head. When you successfully press the barbell over your head and lock your elbows, your whole body will be standing under the weight. That’s why this is a whole body exercise. You will be lifting the most weight that your deltoids can handle, so your shoulders will grow. I work my upper body two times a week. Standing barbell military press is the first workout on one of my two upper body training days. I recommend using a solid belt for this exercise especially when you work your way up to higher weights. 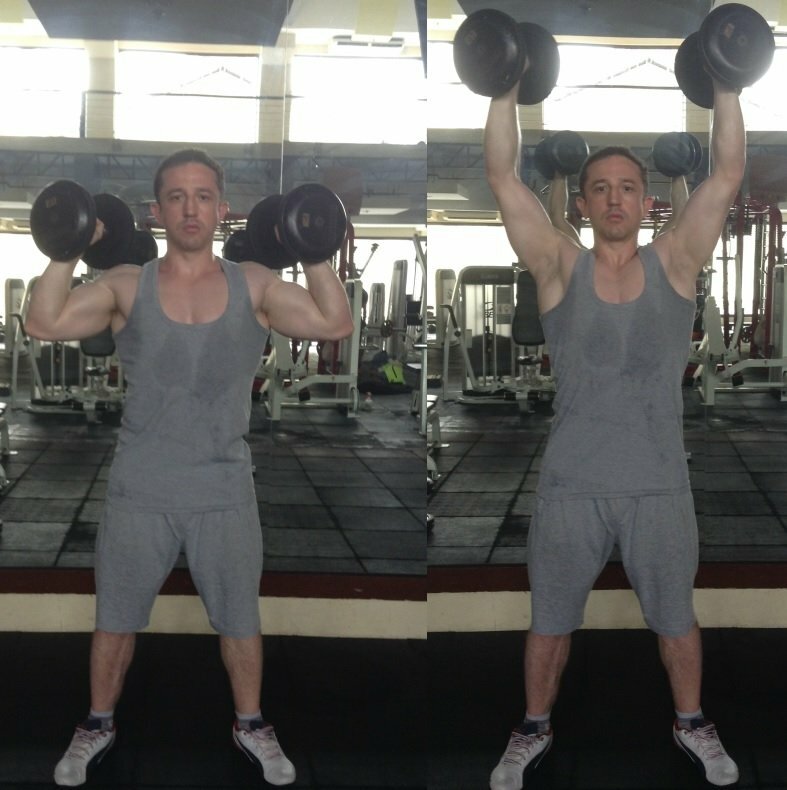 This is a similar exercise with standing barbell military press, except that you will use dumbbells instead of a barbell and you will hold the dumbbells closer to your shoulders as you see in the picture. You will press the dumbbells over your head until your elbows are locked. Since you will not be using a barbell to stabilize the weights you are lifting, you will lift less weight with this exercise than barbell military press. This will allow the stabilizer muscles around your deltoid muscles to grow. Grown shoulder stabilizer muscles means bigger shoulders. Standing dumbbell military press is always my second workout at my other upper body training day. 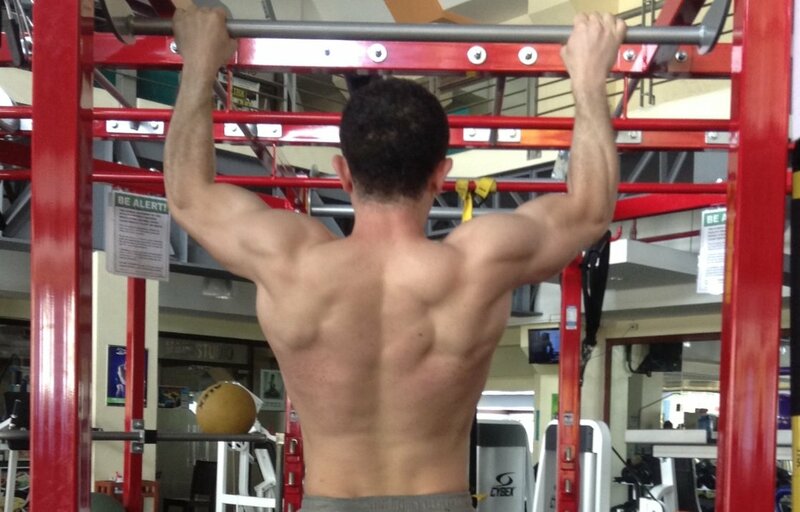 Pull-ups and chin-ups both work your lats and rear delts. While having big posterior and front deltoid muscles will make your shoulders appear impressive, bigger lats will make them appear even more impressive. If you can’t pull yourself up, try pushing yourself up with the help of your feet until your chin is above your hands, then go down in a controlled way. Perform the pull-ups like this until you can do a full pull-up. Pull-ups have no rep limits. I always do as many pull-ups I can do per set. When you master the bodyweight pull-ups, you can advance to weighted pull-ups. I do pull-ups or chin-ups on both of my upper body training days. Dips are an excellent workout to train your triceps, upper pectorals, and anterior deltoid muscles. If you can’t perform a full dip, you can do a half dip. If you can’t push yourself up when you are down the parallel, try pushing yourself up with the help of your feet and going down in a controlled way. 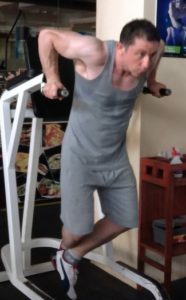 Perform the dips like this until you can do a full form dip. Dips have no rep limits. I always do as many dips I can do per set. When you master the bodyweight dips, you can advance to weighted dips. You can also lean slightly forward or slightly backward while performing dips depending on your training goals. If you want to grow more of your frontal muscles lean slightly forward. If you want to grow more of your back muscles, you can lean slightly backward. I do dips on both my upper body training days. Farmer Walks are excellent for your traps and deltoids. They also help to improve your grip strength and forearms. Pick two heavy dumbbells at each of your hands and walk for 30 seconds. If you can easily walk more than 30 seconds with the dumbbells in your hands, increase the weight. I do farmer walks on one of my leg days. These 5 are the best shoulder workouts you can do. Don’t forget that doing only shoulder exercises is not enough to build an impressive body. You have to do other full-body exercises such as deadlifts and squats. And, always remember that bodyweight exercises are an excellent way to build a great muscular foundation. If you are a beginner and can’t get into lifting weights yet, don’t fret. Try doing some bodyweight exercises. Nobody starts from the top. 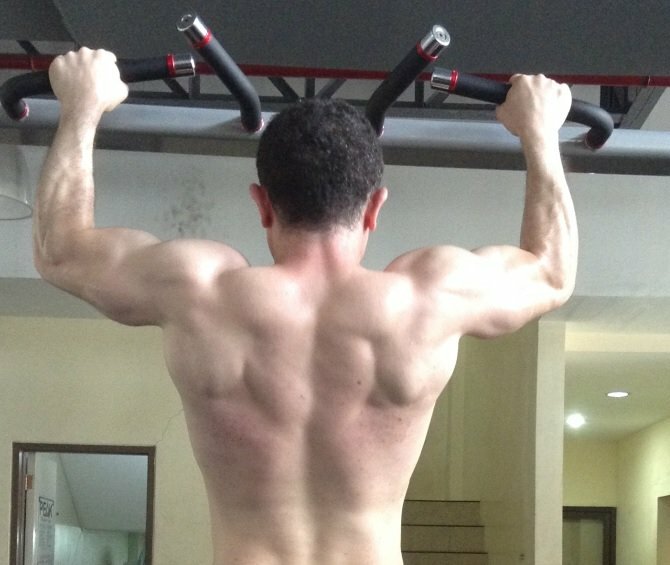 When I started bodyweight training, I was not able to perform even one pull-up. As you can see from my old pictures, I was fat, weak and out of shape. I worked hard and built a body I can be proud of. Just remember that it doesn’t happen in one day. Train hard, be consistent and you will get there.